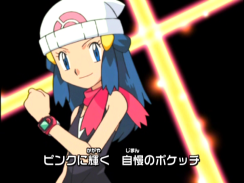 By Your Side ~Hikari's Theme~ (君 のそばで〜ヒカリのテーマ〜) is the first ending theme to the Diamond & Pearl series. Go go go!! GO GO GO !! Kimi to nara yeah!! 君とならYeah!! Issho ni step!! 一緒に Step!! I do a "Coin Toss." I want to say "It'll be OK"
More than I want to say "Do your best." If I'm with you, yeah! As the journey goes on. If I'm with you, then yeah!